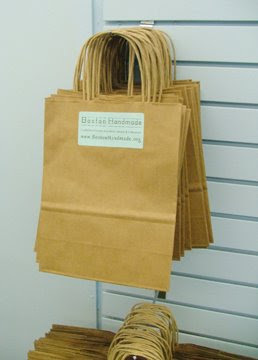 Boston Handmade: Boston Handmade Downtown - The Place To Be! 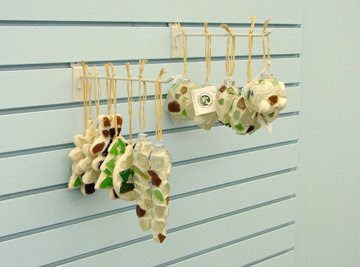 Boston Handmade Downtown - The Place To Be! 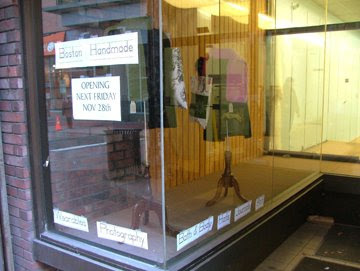 The activity in the Boston Handmade Downtown retail gallery space continues at a fever pitch! Exhibitor volunteers have been pouring in all week to help set up the space and prepare for holiday shoppers and enthusiasts of all things handmade. We have less than a week before our opening date of Friday, November 28th and we are well on our way to welcoming the public into our handmade home. Shopping bags for gifts and goodies are emblazoned with our logo, ready and waiting for Downtown Crossing to discover the wonders of gifts made by hand, and display windows announce our upcoming arrival to the neighborhood already bustling with seasonal spirit. 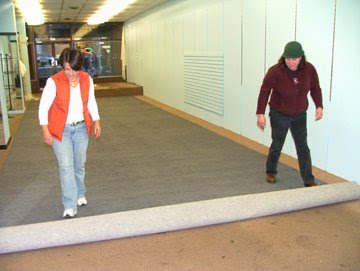 The big happening on Thursday was the arrival of our floor covering. Nancy and Betsy rolled it out and the fit was perfect! Yesterday was a HUGE day for the gallery as we gratefully accepted donations of display fixtures from local merchants and property owners in Downtown Crossing. The neighborhood is being phenomenally welcoming to us and assisting in our arrival in many ways. It took quite a few helping hands to bring all of the displays down Washington Street and into our space and we couldn't have done it without the assistance of Boston Handmade members Betsy, Lisa, Marla, Brooke, Kerry, and an extra helper, my husband Alex. 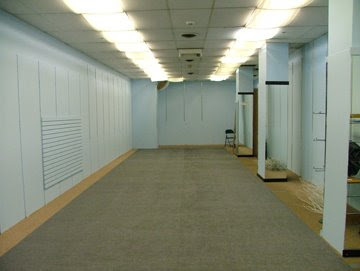 With the furniture and fixtures in the space, we are ready to receive inventory from the 30+ gallery exhibitors. A few tiems have already arrived, but everyone else will be delivering their goods today and tomorrow. It is amazing to me what can be accomplished in so short a time when there is a group effort behind it. I may have gotten the ball rolling, but it is the dedication of everyone involved that is making this gallery a reality. 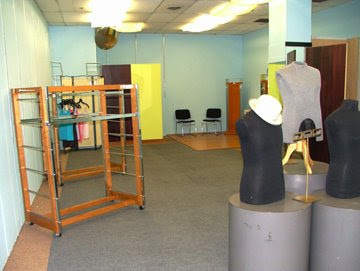 The space looks fantastic! All of your hard work is certainly paying off! I can't wait to come by and check it out. WOW! how amazing Boston Handmade has grown! Congratulations and look forward to seeing all the goodies available through the shop! Jessica you are amazing to land such a great place. I had a blast today!! I love the space, love everyone involved and very happy to be a part of this. Thanks so much Jessica for all of your hard work. You guys totally ROCK! Best of luck with the gallery - I've blogged about it and hope folks come pouring in! Looks fabulous! I am so proud of you girls! Jessica you are amazing. I can only imagine what a project this is to get up and running. I may be vacationing in Florida right now, but my thoughts are in Boston and, more specifically, Boston Handmade Downtown. It's looking great...can't wait to see it all transformed when I get back! I am SO excited for all of you; this is huge! I want to type this whole message in caps . . . the best street team ever! I miss you guys! Yay! You guys have worked soo hard, and it is totally going to pay off!